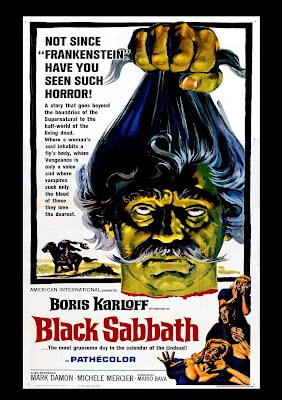 "Black Sabbath" (1963) is a trio of atmospheric horror tales hosted by Boris Karloff and starring: Michèle Mercier, Lidia Alfonsi, Boris Karloff, Mark Damon, Susy Andersen and Jacqueline Pierreux. There are two versions of this film, the original Italian version and the American Version from American International Pictures (AIP) dubbed into English. The language is not the only difference between the versions, there story order is different and one of the tales is quite different between the two versions. Also, the music is different in both versions and there are some different story intros by Boris Karloff. "Drop of Water" (American 1 / Italian 3): Helen Chester (Jacqueline Pierreux) a nurse, is called in the middle of the night to a client’s mansion by the maid (Milly) who informs her the old lady is dead. Helen arrives at the mansion on the stormy night and is led through the decaying mansion filled with cats to the old lady’s room. There we see the dead old lady with eyes wide open and a grin of terror on her face. Helen’s job is to dress the lady for the caretaker the following morning but on the dead woman’s hand is a ring with a huge jewel that is calling out to her. Helen cannot resist and she takes the ring off her finger. When she gets home and tries on the ring, she is haunted by an increasing level of terror from beyond. This is my favorite story and the scariest and most haunting. "The Telephone" (American 2 / Italian 1): The young and beautiful Rosy (Michèle Mercier) returns home from a night on the town and someone keeps calling and harassing her. She soon discovers it is her ex-boyfriend Frank and he seems to be able to see her right in her apartment. In the Italian version, Frank is supposed to be in prison and has escaped plus Rosy’s friend Mary (Lidia Alfonsi) isn’t as innocent as she seems. In the American version, Frank is supposed to be dead, the revenge plotline is missing and it is more of a ghost story. Either way, the tension poor Rosy is experiencing is more than palpable and the story is filled with thrills and dread. “The Wurdalak” (American 3 / Italian 2): Nobleman Vladimire d’Urfe (Mark Damon) is riding his horse in the Italian countryside where by the river he discovers a headless corpse with a knife in its back. He rides further to the nearest house where he finds a family of siblings Pietro (Massimo Righi), Sdenka (Susy Andersen) and Giorgio (Glauco Onorato) and his wife Maria (Rika Dialina) and son. They confirm the dead man is an evil man who their father Gorca (Boris Karloff) had left 5 days earlier to find and kill. But, Gorca warned his family that if he should return any later than 5 days, they must not let him in because he will have been turned into a Wurdalak or Vampire. When he returns just after the fifth day, he is not the same and the family and visitor will soon find out who or what has really returned. Great acting by Karloff and constantly foggy and eerie atmosphere make this another standout in the anthology. As of this writing, the Italian version with English subtitles is the only version available on DVD but the American (AIP) version is available for streaming on Netflix. “Black Sabbath” is an excellent example of atmospheric horror and great storytelling no matter which version you watch!